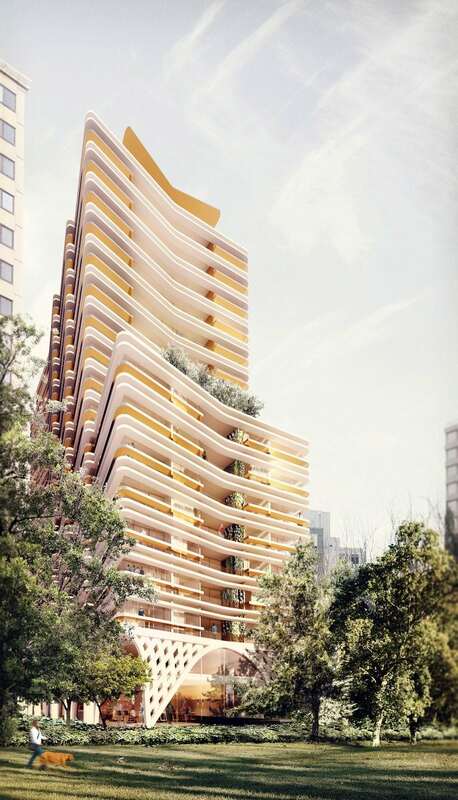 Poised between the leafy boulevard of St Kilda Road and the lush, green expanse of Fawkner Park, the latest apartment tower design from Luigi Rosselli Architects seeks to introduce some sensual Sydney style to the City of Melbourne. 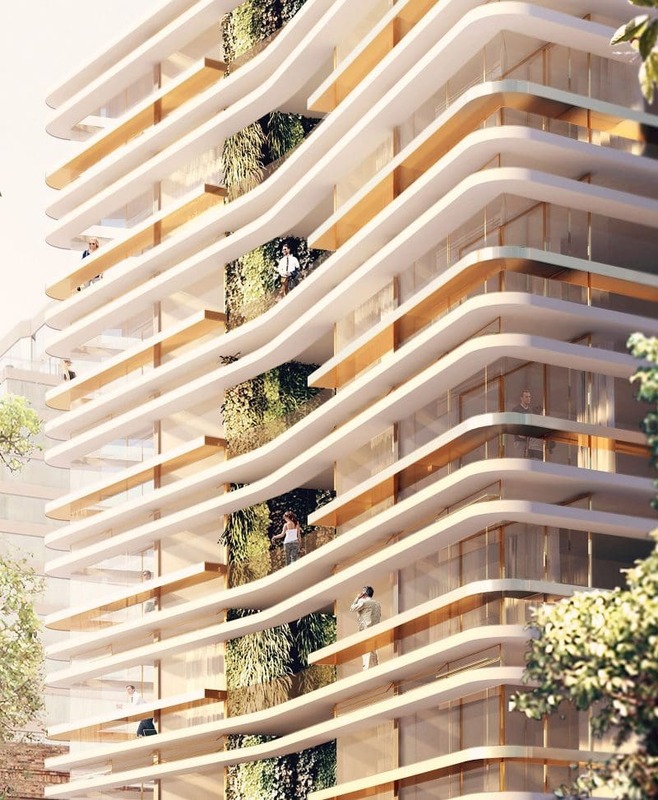 Developed as part of the transformation of St Kilda Road into a high end residential apartment quarter, it seeks to replace a faceless low rise office building with an urban high rise that makes the most of its park side location. The stepped form was developed to maintain a view corridor from the Shrine of Remembrance, setting out the podium form with a narrower tower on top that remains unseen from behind the Shrine when viewing from the State Library of Victoria on Swanston Street. The saw tooth plan form of the 131 apartments are set out on the deep block in such a way that solar access and views are maximised along the length. Taking lessons from the nearby iconic Stanhill and Newburn Flats by Romberg and Shaw, the apartments are angled to allow both privacy, as well as uninterrupted views of Fawkner Park to the east and Albert Park to the west from the majority of rooms. 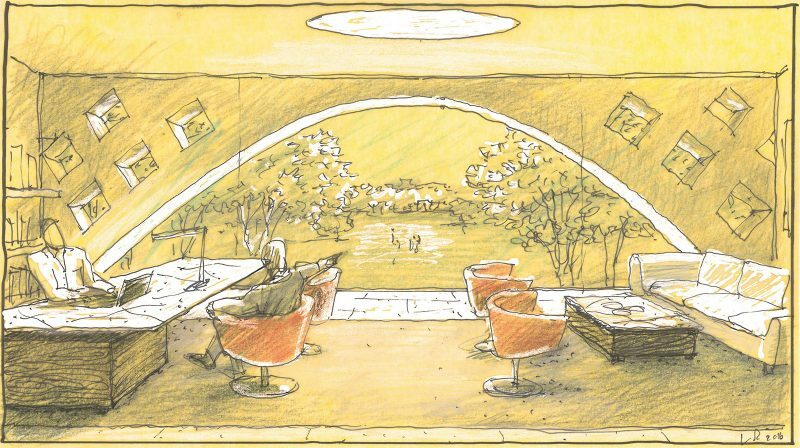 These early projects illustrate the emergence of European Modernism in Melbourne in the 1940’s, and a rich seam of inspiration for Luigi Rosselli Architects. Swiss trained, Romberg worked closely with Victorian heavyweights Roy Gounds and Robyn Boyd. In elevation the tower takes on a sensual and stratified appearance through the use of a series of horizontal precast concrete shelves that shelter the apartments from the midday sun, whilst minimising the interruption of views. Their curved edges undulate as they wrap the building form. Alternating gold tinged blades lend the building an uncommon warmth next to its cold glass neighbours. The importance of the landscape is carried over to the tower’s fabric. A large roof terrace on the podium serves the buildings residents and carries the park landscape over the building. Green walls on balconies transition from the interiors out and provide verdant frame for the view. 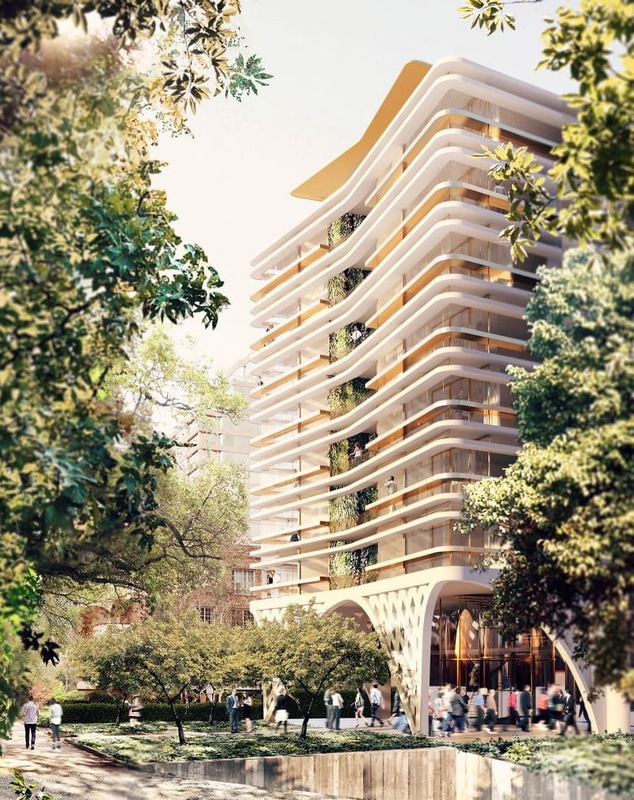 St Kilda high rise supplements its occupants access to a vast parkland for outdoor recreation with indoor pursuits including a lap pool and spa, sauna, gym, wine cellar, theatre, meeting and function rooms to make sure all needs are catered for. The low rise elevation facing St Kilda Road serves as the main entry to a ground floor retail space. A concrete lattice forms the structural legs of the upper floor. Layers of precast concrete and green walls temper the outside environment. 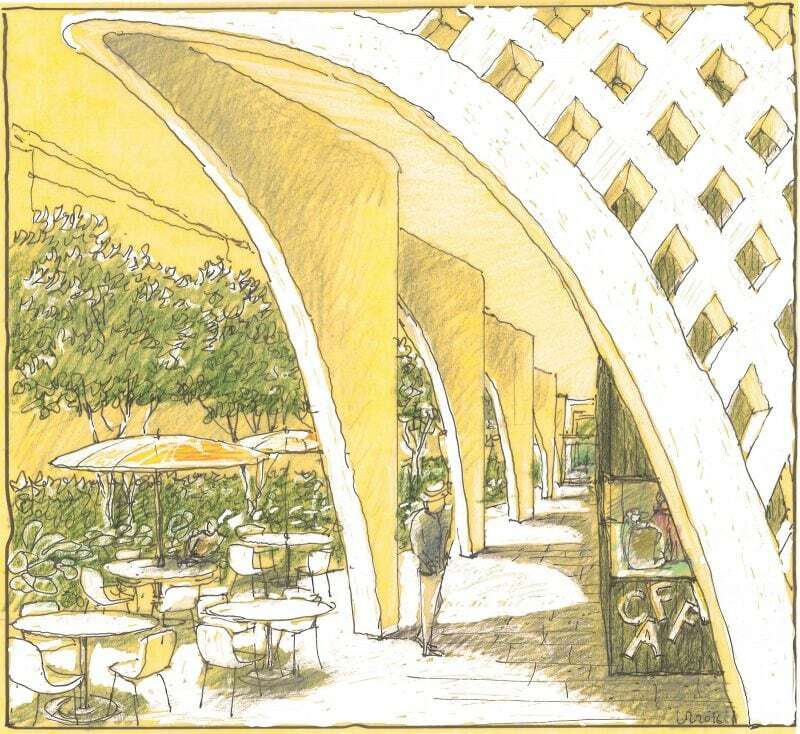 A covered portico is formed between the undulating structure and the ground floor commercial space, framing views of the landscape to the north. It draws visitors down the side of the building to the residential foyer at the centre. The typical corner apartment uses warm neutral finishes to emphasis the spaciousness of the rooms and draws your eye to the view. The living room opens seamlessly out to a winter garden. A lush lap pool evokes the best health clubs. 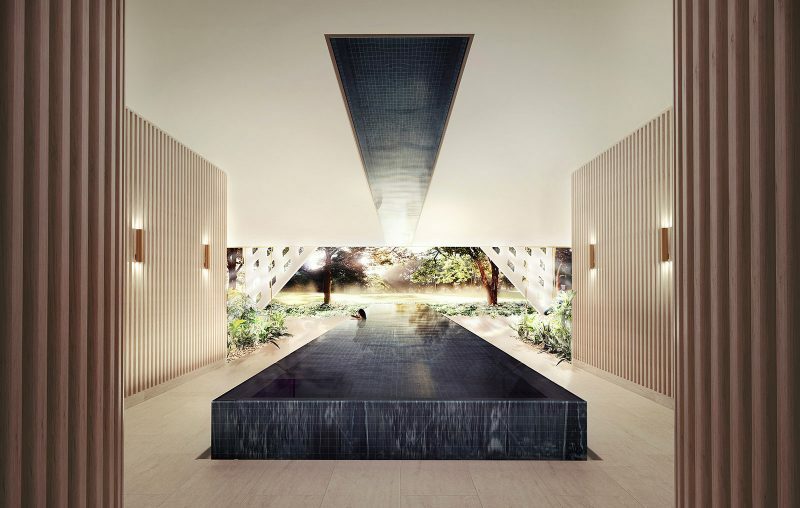 A spa, sauna, gym and function rooms give the residents ample opportunity for indoor recreation, whilst feeling part of the adjoining public park. 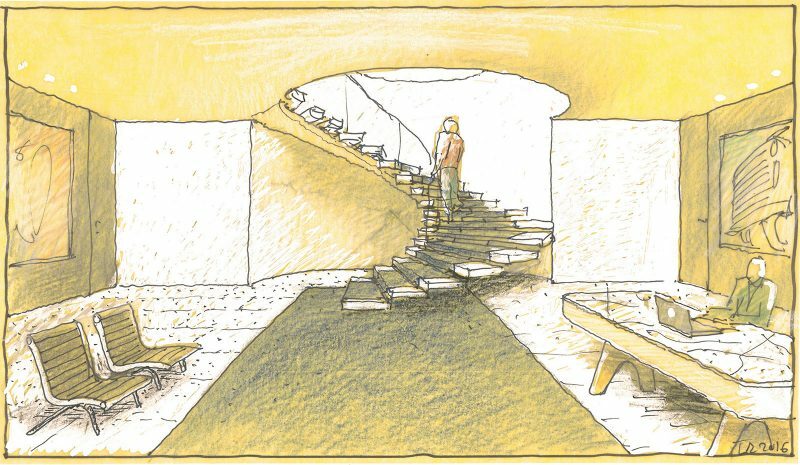 The lobby of the ground floor office leads, via a spiral stair, to the upper level. The company director’s office occupies the prime position on the first floor overlooking Fawkner Park. The concrete structural lattice frames the view. Horizontal concrete sun shades shelter the apartments from the midday summer sun. They also support operable glass screens that form a winter garden, a perfect spot to sit in the cooler months. 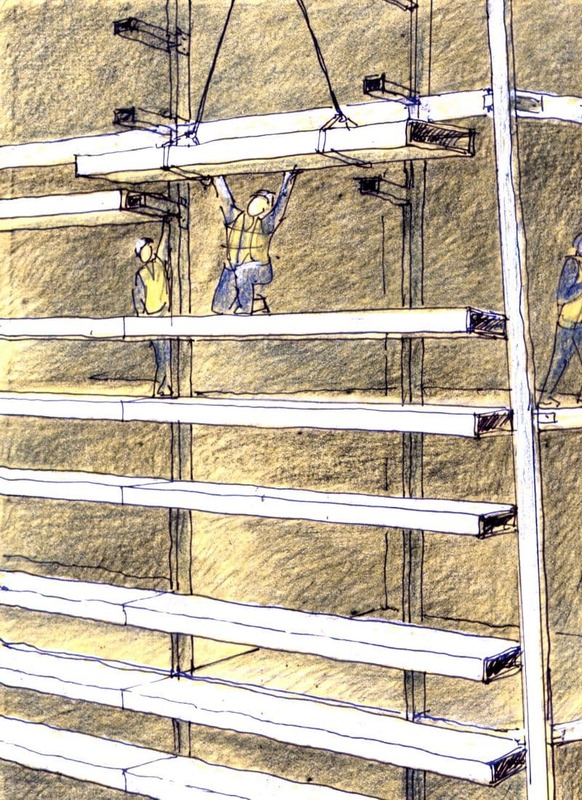 The facade assembly is illustrated. Precast concrete GRC beams are fitted to a steel frame. 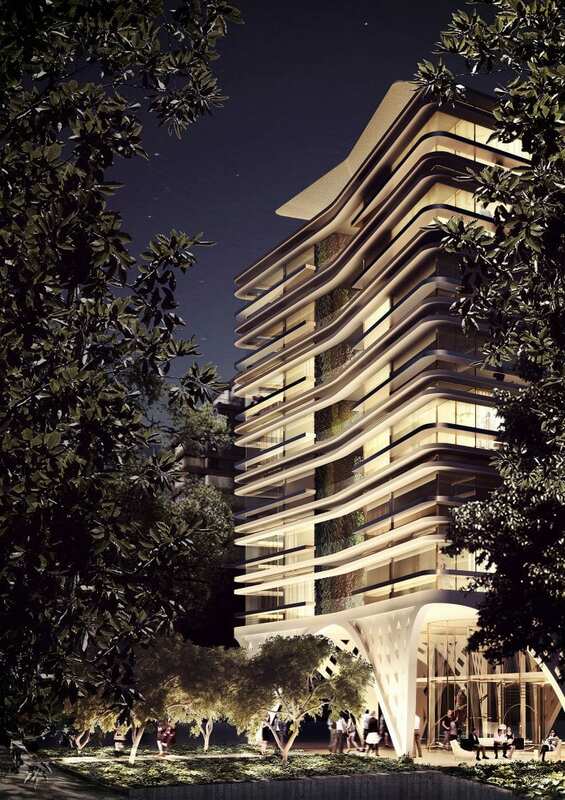 At night time the St Kilda Road façade comes alive as light plays across the horizontal sun shades.